Emirates Boeing 777-300, serving the Dublin to Dubai route. It's being billed as the airline industry's latest 'gamechanger' - a fully-enclosed, First Class suite inspired by Mercedes-Benz. 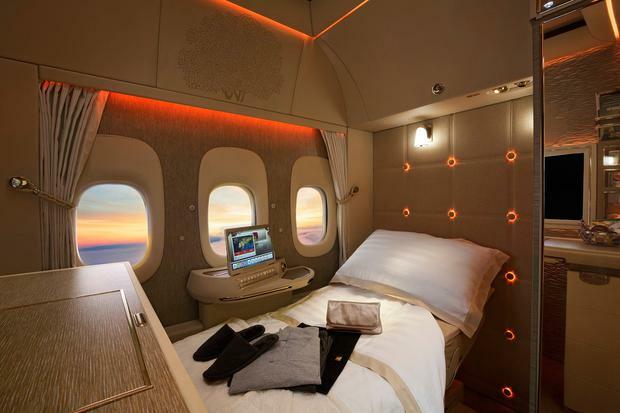 Emirates' new private suites, set to enter service on its new Boeing 777-300ER aircraft from December, feature some 40-square-feet of private space. Sliding doors make them the first in the industry to close fully, and customers can video call the crew for service, receiving canapés and drinks via a special window. Suites also come with a 32-inch full HD screen, a personal wardrobe and private stowage space for carry-on bags; soft lighting and temperature settings that can be customised at a touch of a button; and binoculars to take in the mile-high views. Emirates operates Boeing 777s on its Dublin to Dubai service, but has yet to confirm whether the suites will feature on the route this winter. If they do, however, Independent.ie Travel has learned that return fares will start from €4,369. They're far from the first airline suites, of course - Singapore Airlines also unveiled an upgraded A380 First Class suite this month (couples travelling together are offered the option of a double bed), while rival Gulf carrier Etihad boasts a three-room 'Residence' starting at $20,000. Qatar Airways, which recently began flying from Dublin to Doha, is also rolling out a QSuite with adjustable partitions that can create communal spaces. 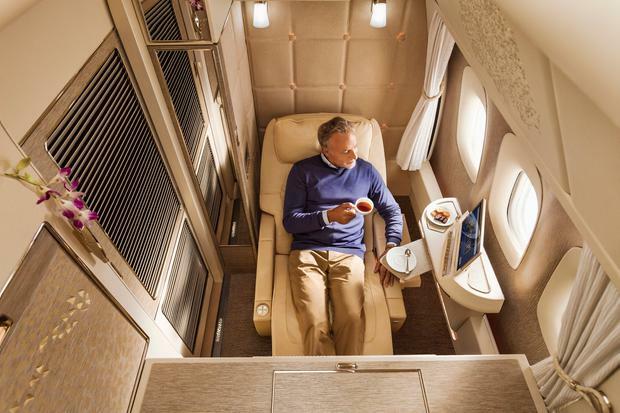 Though many other airlines are scaling back First Class products, preferring to add more business and premium economy seats, suites provide privacy for super-wealthy clients, comfy beds, and a catchy marketing opportunity - as Emirate's ad campaign with Jeremy Clarkson (above) shows. Previously, the airline worked with Jennifer Aniston on a range of ads for its A380 business class, featuring its now-iconic circular cocktail bar. The new First Class private suites feature seats inspired by the Mercedes-Benz S-Class, according to the airline, with customers also able to avail of Emirates lounges, a chauffeur-driven airport service and a check-in baggage allowance of 50kg. Amenity kits include beauty products from Sligo's VOYA. All suites offer a window view, though those positioned in the middle aisle are fitted with virtual windows that live stream views from external cameras. "It even comes with pyjamas," as Clarkson quips. Review: What's it like to fly Emirates Business Class?